Ever got to the point where your radio needs a master reset, and you start thinking, I'm going to lose all my menu settings, and memories? 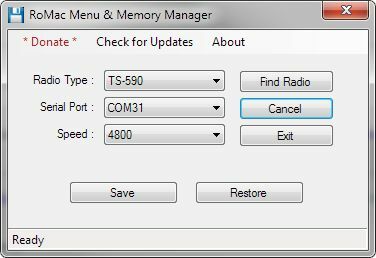 This simple but powerful utility will save all the menu settings and memories in your radio in less than minute, and when the time come to restore the menus and settings, you'll be back up in running with your radio in hardly anytime at all. Select your radio model, click find radio, and then click "Save", and your done! When you need to restore the settings, do the same steps, except click Restore and in less than a minute, your radio will have all the menu settings and memories back. After a full reset on a radio, the baud rate of the radio will be at its default. Use the "Find Radio" to reconnect. This utility supports the following radios. Yaesu FT-450, FT-950,FT-991,FT-1200, FT-2000, FT-3000, FT-5000, and the FT-9000 (some FT-9000 models may just save memories). Kenwood TS-480, TS-570, TS-590S, TS-590GS, TS-870, and TS-2000. Note: Yaesu radios, change the CAT TOT in the radios menu to 100 ms. If you wish to use PayPal make a small donation, click on the "Donate via PayPal" button. Download, play with it, and let me know what you think about it. Requires Windows XP SP3 or later. Hope you find this little utility useful.